It is believed in Irish Mythology that Danu , also known as ANÚ, was the Earth Goddess from whom all life emerged; she embodied the earth, rivers and sea. She offered fertility, abundance, regeneration and nurturing. 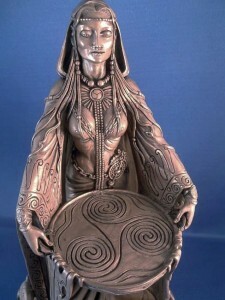 She is considered the mother goddess of all Celtic gods and mother of Ireland original mythical inhabitants the Túatha Dé Danaan, or fairy-folk. The name Eire is a derivative of the name Eiru also an aspect of ANÚ. In County Kerry there two hills side by side named The Paps of Anú. These are known as the breasts of Danu which suggest the deep connection of Ireland to this deity.